Adventures in Hectic Eclectic: Fall. Five Minute Friday with Lisa-Jo Baker. Five minutes of writing on a prompt. I have started my life from scratch four times in this particular lifetime. Finding myself at the "from scratch" part was always preceded by some or other dramatic lifechanging event: divorce, then two years later moving from London to rural England after I got out of an abusive relationship, ending another relationship and then moving back to South Africa from England. The before-you-get-to-scratch part is hairy and frightening and earth and soul shaking. It's not pleasant when all these emotions fears surface to challenge you. And then comes the decision to make a change. And you can stay forever in the decision place because it seems a lot more hopeful than the The before-you-get-to-scratch part or even the from-scratch part. It's comfy over there. Like being swallowed by a nice warm cloud. The hard part is the fall, the leap, the letting go. After the decision place. After the decision place you actually have to take action and the thing is, the fear hasn't left. But you do it anyway, trusting that it will be okay in the end. Nearly six years ago, I let go of all I knew in England, gave most of my stuff away, packed 22kilos into my suitcase and returned to South Africa with nothing. Not a thing except the 22 kgs of clothes, books and CDs I brought with me and R 4 000.00 which was enough to get me through one month. I made the decision. I leapt. I fell. I did it. Was I scared? Yes. Was I unsure? Yes. 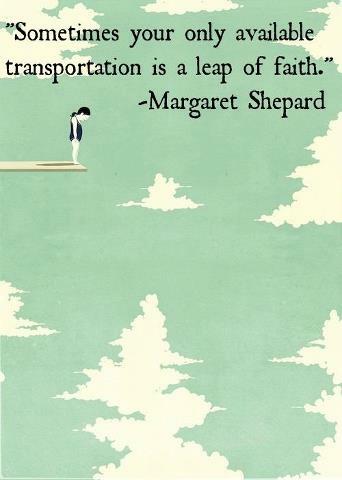 But sometimes, as the picture says, the only mode of transport is a leap of faith. 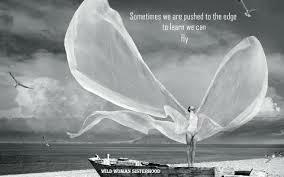 Sometimes that leap of faith is what you need. I hope returning back to SOuth Africa has led to all you wish. Indeed it has. I have my own business with my wife and I met her here, in South Africa. We are happy. Life is good. Love the quote you shared at the beginning...those leaps of faith are scary but so rewarding. Praying you enjoy each adventure on your journey! (Curious where you live in SA...hubby and I made a trip to Cape Town in 2004. I loved it so much, I was ready to move there.) :) Have a great weekend, friend! Thanks, Mel. I live in Alberton, a city just south of Johannesburg. More like the conjoined twin of Johannesburg.